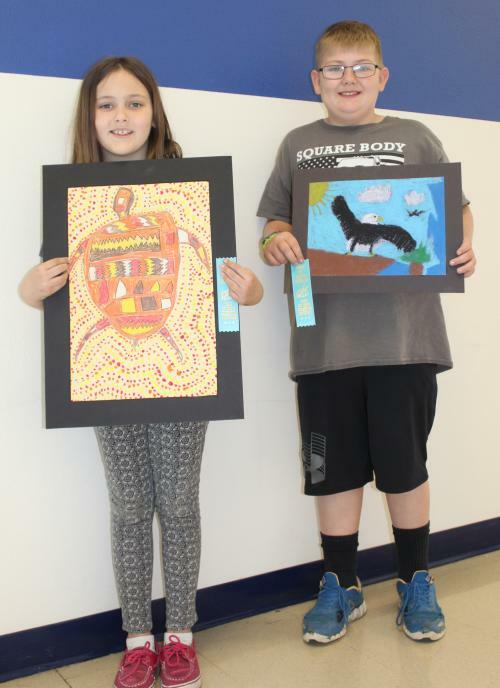 Artwork by two Chanute Elementary third graders was chosen to hang in a statewide exhibit at Topeka during Youth Art Month. The pieces by Anna Orton and Carson Grady were chosen by the CES art teachers, who are allowed to submit one piece of student work from their school for the annual exhibit sponsored by the Kansas Art Education Association. Anna Orton used paint and colored pencils to create a piece that resembled the style of drawings found on cave walls. “That’s why the paper is not exactly white,” she said. Art teacher Brett Rinehart said his students looked at examples of Aboriginal Australian artwork. They picked an animal from that region, drew the outline on paper and then filled it in with designs similar to the animal. Carson Grady, said he was given the choice of using crayon, colored pencil or pastels to draw an animal in color. He chose to use pastels for his eagle. The art exhibit was held in a gallery at the Topeka Shawnee County Public Library this year for several weeks. The KAEA also held a reception for the students and their parents.